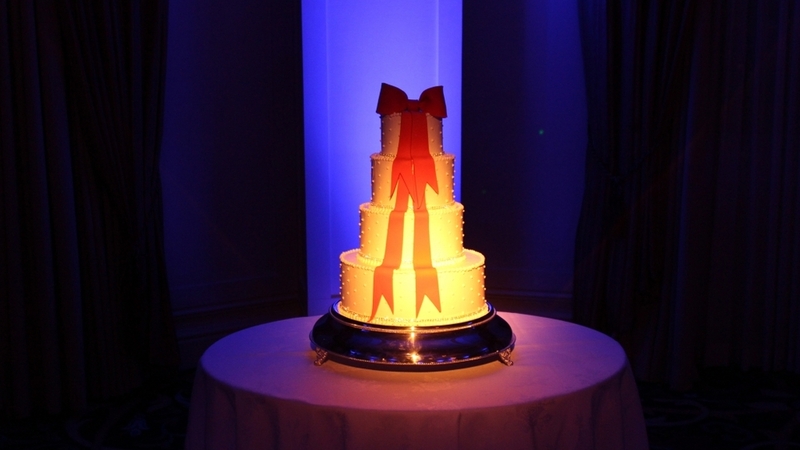 Pin Spot Lighting is an innovative way to add a subtle touch of elegance and vibrance to your wedding day accessories. Popular to be used on centerpieces, sweetheart tables and wedding cakes, Pin Spot Lights effectively and unobtrusively create concentrated pools of light in specific areas that you wish to bring extra attention to on your wedding day. Klock Entertainment uses Fuel Angle Lights to achieve the effect seen in the photographs above. After fully charging these battery-powered fixtures, Klock's lighting techs cleverly secure the Angle Lights to a metal surface on walls or ceilings with the Angle Lights strong magnetic base. The fixture can then be adjusted and focused 360 degrees around the room, with the appropriate brightness and distance being taken into account. These fixtures were previously limited to use in venues with metal structures. Klock Entertainment can now elegantly and safely secure the Angle Light in any venue with our fixture support beams, which can be hidden from view of your guests while still placing the fixtures within a proper distance of your table centerpieces or cake to add a subtle elegance to your florist or baker's hard work. We understand the patience and technical prowess that go into the planning of each detail of your wedding day. Our Pin Spot Lighting easily showcases these details and brings them into the spotlight. Newer PostKlock Staff's Movie Picks For the Holidays!